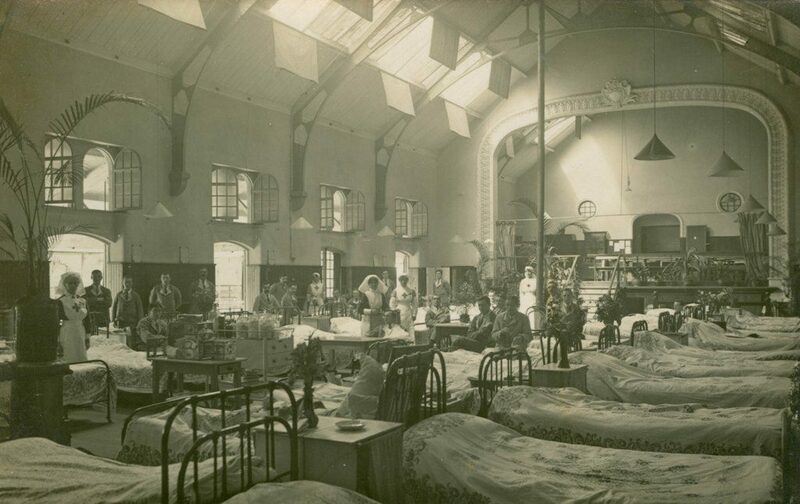 In 1915 it was decided to convert Chippenham Town Hall in to a Red Cross hospital and in just a few weeks a new kitchen, bathrooms and toilets were built. With maximum space required for beds there was no room for a laundry and so this task fell to volunteers. Dora Belcher, Assistant Quartermaster at the hospital, was responsible for maintaining clothing and linen supplies. With up to 100 patients at a time the laundry was a major weekly task. Ladies around the town would take in laundry and the senior girls at local schools would be taken out of class to help with the washing. People in the surrounding area also offered their help. In Lower Stanton the whole village came together to ensure Chippenham hospital had clean sheets and clothes. Maria Gardner and her husband Henry, of Lower Stanton, despite being dependant on poor relief, volunteered a great deal of time to ensure that Chippenham hospital was supplied with clean laundry. The Red Cross wrote about Mrs Gardner “She sorted, distributed, collected and re-packed the washing done in Stanton for Chippenham V.A.D. Hospital. She also washed 24 articles weekly and made no charge whatever”. Henry, despite having lost a leg a few years earlier, travelled to Chippenham twice a week in his pony and cart to collect and distribute washing around the villages.